This month's We Should Cocoa is hosted by Laura at I'd Much Rather Bake Than... who has challenged us to use coconut in our confections. Last month's round ups can be found on the hosts blogs of the respective challenges - Choclette's blog and Dom's blog. 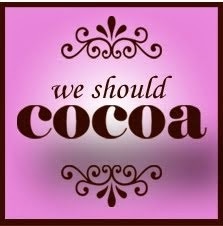 You can read all about We Should Cocoa and how to enter by clicking here. Some items of food have a certain order in which their components should be eaten. My favourite one to do, when I was younger, was iced gems. The biscuit bases would come off first and the piped icing tip would go back in the bag. Then you'd have a bag of pretty much pure sugar nubs that dissolved when you sucked them. I tried to recreate them but with meringue and chocolate. Because they are two of my favourite things. Plus they are a little bit less tooth achingly sweet. 1, First, make the meringue. These can be made in advance and stored in an airtight container somewhere cool for a week. Or you can freeze them. 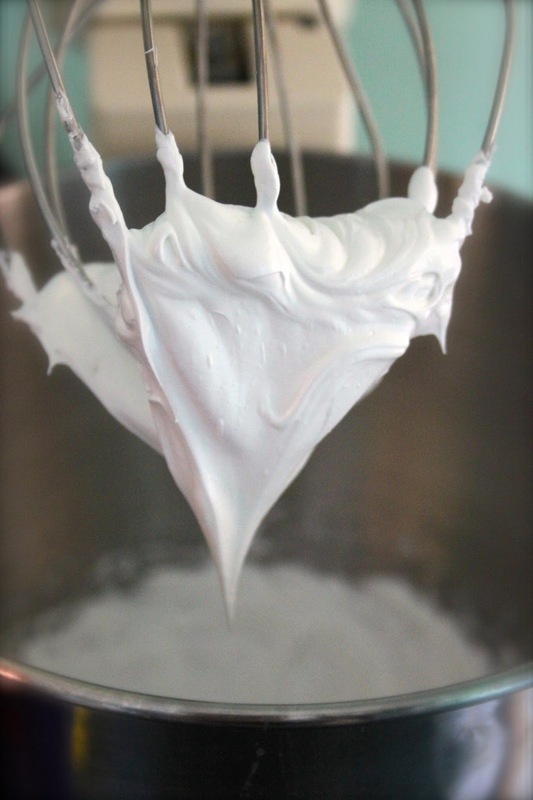 Meringue magic. 2, Beat the egg whites until they start to foam up and double in size. With the beaters running, slowly add in the caster sugar and drop in that vinegar. This now needs to be beaten until it is a thick glossy white. See beater for reference. 3, Decant into a piping bag fitted with a star tip (size is up to you, you could make giant ones) and pipe little rosettes onto lined baking sheets. Mine were roughly 1.5cm across. 4, Preheat your oven to 100o/c and bake these for an hour. When the timer has gone off, turn off the oven and leave it to go completely cold with the meringues still inside. 5, Make the biscuit based next by creaming the butter and sugar together until pale and fluffy. 6, Beat in the egg and coconut extract. 7, Sift in the flour and salt, and add in the toasted coconut bring together into a ball of dough. 8, This needs to rest in the fridge for at least an hour before rolling out. It may seem a little sticky but will firm up in the fridge. 9, Preheat your oven to 190o/c and line two more baking sheets with greaseproof. 10, Roll out the dough on a lightly floured work surface to around 3-5mm and cut out the biscuits that are just a bit bigger than the bases of the meringues. I used a Diet Coke bottle lid. 11, Place these onto the lined baking sheets and bake for 5-7minutes or until they are just going golden brown. These biscuit bottoms barely spread so will keep their shape quite well whilst baking. 12, Transfer the cooked biscuits onto a wire cooling rack and leave until completely cold. 13, To assemble, melt the chocolate, dip the flat base of the meringue in the chocolate and then stick onto the centre of a biscuit. Leave to set somewhere cool (but not the fridge). Store in an airtight container. I eat most things separately. Sunday roasts for example, I work my way around the stuffing, then different kinds of veg, then the fake meaty thing (if I'm having one; sometimes I don't bother), then roasties, then Yorkshire. I am an odd thing. Oh how delicious these are! And I'm glad I'm not the only one who still eats things separately - Twix, Kitkats, the chocolate or sugar shell off sweets...am I embarrassing myself now?! Yes! I'm glad I am not alone! (There is nothing more pleasing than de-chocolating a kitkat) Thank you for your comment Laura! You're absolutely right- the thought of eating an iced gem or Jaffa cake whole is...well, does anyone do that? Those things were designed to be taken apart before scoffing down! What lovely little bakes and photos! Thank you Hazel, they were definitely bigger than the real ones which is always a bonus in my opinion! These are totally adorable Hannah and so much nicer than the old iced gems I used to love so much - do they still make them? I used to bite off the top first and would then nibble the biscuit. Thanks so much for your continued support of WSC - always enjoy your entries.